In this first of a two-part conversation, which took place in New York City just after the book’s September 21 launch, Montgomery and ArabLit editor M. Lynx Qualey talk about the genres inhabited by this seminal pre-Islamic poet; how his cousin ‘Ablah may not have been a symbol of Love, but of Death; and how all warriors might not have been poets, but all poets were warriors. In describing the Arabian Peninsula on which the sixth-century poet we know as ‘Antarah ibn Shaddād came of age, you talk about its isolation. At one point, you call the peninsula of that time a “near-island.” Do you emphasize its isolation because of how this might allow something different to emerge, poetically, like some sort of literary Galapagos Islands? James E. Montgomery: I think my starting point for that comment was an observation was made by Andrew Marsham, a historian of late antiquity and one of my colleagues at Cambridge. He once said to me, “What really fascinates about Arabia is that it looks as if it’s part of the late antique world, and it looks as if it’s not.” So it’s almost as if Arabia’s an idiolect, or perhaps it’s like the Galapagos: things developed in the way in which they did because of this apparent isolation. I say apparent not because I don’t think it was isolated, but partly because we can’t really know and partly because it was in a sense isolated (it was remote), and in another sense not isolated (it was not completely cut-off). And as I said in the introduction to the book, look at the weapons ‘Antarah fights with and where they come from, and the images he uses. Then you start to see that it’s part of a bigger world. As you say, ‘Antarah’s poems refer to the surrounding world through his use of Indian, Yemeni, and Syrian weapons. But what do we know about the imported poetic weapons he might wield? What do we know about the relationships, or generic influences, from surrounding literary territory: Roman, Sassanian, other? JEM: We don’t know where any of the poetry comes from, in the sense of its prehistories, or contacts with the poetries of earlier Arabian cultures and other non-Arabian cultures. 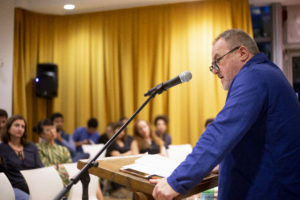 There are those who, like Marcel Kurpershoek, point to the close connection between the tradition of Nabati poetry in the Najd and the classical corpus, thereby indicating the long history of the survival of poetic forms and dialects on the peninsula. I’ve had in the back of my mind in the last 30 years of reading this material that there are oral genres, many now lost, that almost subtend the artistic material that has survived, and have no doubt that we have concentrated too much on the artistic material in our thinking about pre-Islamic poetry. Most theories of its interpretation have been driven and dominated by the canon of formal odes, qasidas, by pre-Islamic poets that tradition has handed us and has not focused enough on the shorter or more occasional pieces, such as raiding poems, curses, insults, or animal descriptions composed as spells to ensure a successful hunt. The start of ‘Antarah’s mu’allaqa, or his “Golden Ode,” the most canonized of the works: Is there anything left to say, has poetry died… Well, it’s a funny place to begin a tradition. JEM: But when you read ‘Antarah, you realize that the different bits and pieces of his poems seem to breathe a living but ancient tradition. ‘Antarah’s mu‘allaqa is a radical refashioning of the components of the formal qasida—I’d prefer almost to say a demolition of the formal qasida, but the structure of the qasida is almost intact at the end of the poem, in the sense that it is recoverable and identifiable—well almost. Some scholars have suggested that it is in fact a patchwork of different pieces attributed to ‘Antarah and brought together at a much later stage in the tradition so as to constitute a poem. The first line of his mu‘allaqa positions him squarely in combat with earlier poems and their poets. It’s a battle-cry, a challenge, and so very typical of his ethos. What are the genre traditions he’s inhabiting? JEM: There are a number of things that seem to be happening in the ‘Antarah corpus. At the basic level, there’s the genre of celebrating tribal victories and raids. There’s a lot of that poetry that survives and it has not received much scholarly attention. It all stems from North Arabia, from Najd. The raiding poetry that we have examples of in ‘Antarah’s corpus is similar to that composed also by poets belonging to tribes who were neighbors with ‘Antarah’s clan, ‘Abs, and both groups were often at war with each other. There’s clearly a pattern, or a tradition or a genre, whatever you call it, that’s happening there. Then there are the soothsayer-like pronouncements, the very short poems that are difficult to disentangle because they are couched in a sort of enigmatic and almost vatic style, where the poet or the speaker is perceiving reality in a way that is not accessible to the rest of his audience. The strangest poem in the whole corpus is the mu’allaqa. It is, in terms of its poetic reach, unlike almost anything else that’s in the diwan, until you see it—as Richard [Sieburth] suggested—as a series of set-scenes, and then you can begin to draw out connections in the mu’allaqa with the rest of the corpus. 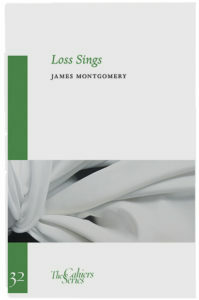 You also recently translated work by the sixth-century Arabian poet Al-Khansāʾ as part of your cahier Loss Sings. She’s from a similar time and place, although her work approaches Death in a very different way. JEM: Al-Khansāʾ was from the same tribal group as ‘Antarah, and was probably a younger contemporary. At a lexical level their poems have a lot in common. We haven’t properly studied tribal traditions amongst the pre-Islamic poets in enough detail. There’s some work that’s being done by my Cambridge colleague Nathaniel Miller in distinguishing between a Southern Arabian poetics and this Northern Arabian poetics. That work is pretty much in its infancy, but it’s starting to suggest very productive connections and distinctions. At the launch event at Poet’s House, you started to talk about the relationship between violence and poetry, which is certainly one of the animating elements of this body of work. Could you talk a little more about how violence works inside these poems? JEM: These are the poems where the poet is “ripping the lid off reality and plunging his arms in”—I think the phrase is Anne Carson’s. Those are the ones that I really like, and certainly in the mu’allaqa that’s what’s happening. In the poem, all of reality is being torn apart and transformed and mutilated and metamorphosed, whether it be creatures like the camel, whether it be opponents, whether it be objects. There are the amazing passages where his war horse is moaning at him, almost endowed with speech. And then again, this poem looks like a love poem for ‘Ablah, but actually, I think, it’s a prayer to Death. As I mentioned at the talk on Friday, its ending features the avatars of death: the vultures, the hyena. I think myself that ‘Ablah is an avatar of Death. JEM: My hypothesis is that there was some form of goddess worship prevalent in this warrior cult, in a way that I can’t flesh out properly yet; it’s just a hunch. But we have the word ‘Ablah, whose name can mean a lance, for example, and there’s a lot of fetishization of weaponry in ‘Antarah’s poetry. I think there’s a component to the conceptual universe of pre-Islamic poetry at work here that we’ve not quite got yet. The work by Nadia Jamil at Oxford in her book [Ethics and Poetry in Sixth-Century Arabia] has been very, very important in helping me see this, especially her ideas about time, and about chance, and about understanding pre-Islamic poetry as a symbolic language and not as an “accurate” record of the thoughts and feelings of sixth-century Bedouins. The poetry could quite conceivably be that record, and that is how the Arabic tradition has seen it, but I’m much more interested in thinking about it as a symbolic language. The problem is I haven’t worked out yet what all the symbols are. A 19th-century tattooing pattern depicting ‘Antarah and ‘Ablah. Public domain via Wikimedia Commons. The Golden Ode, or the mu’allaqa, is doing many different things. There is a structure that holds it together, but it’s done in such an unusual way that many scholars have argued that it’s just a patchwork of individual poems that were put together by Abbasid scholars or those later. But actually, what’s happening is that the qasida is also being transmuted: It’s being given a new shape, forced to change like the she-camel who, at the beginning of the section, can’t lactate because she’s been mutilated in order to improve her stamina. Then, at the end, we learn that she’s been masculinized, that is, she’s become as big as a stallion male. So I think the same thing is happening to the qasida as is happening to the animals and the weapons and the human beings in the poem. JEM: What I was referring to was how the fact that ‘Ablah has four different names is an indication of this destabilization of the qasida form. It looks like what we would call a conventional pre-Islamic poem, but when you scratch the surface, it actually contains pain and anguish and grotesquerie. Not that I think there actually is such a thing as a typical pre-Islamic poem, but, in what we usually think of as a conventional pre-Islamic poem, there’s one woman, she has a name, she’s then given a number of epithets. In ‘Antarah’s poem, she’s ‘Ablah. But then she’s also Daughter of Mālik. She’s also Daughter of Makhram. She’s also Mother of Haytham. And the fact that these are recognizable names within the system of Arabic nomenclature and not epithets struck me as significant. She’s constantly changing her position in the poem. And changing her relationship to others? JEM: Her relationship to others, and possibly to ‘Antarah. And then of course there’s the name ‘Ablah itself. The adjective ‘Abl may mean a slender and supple spear, and maybe ‘Ablah is in fact the epithet and not the name. That gets me back to how maybe she’s an avatar of Death, and maybe she’s a personification of weaponry or a fetishization of weaponry. I don’t know the answers to these thoughts; all I know is it’s important to keep open, to stay receptive to the possibilities. On the subject of authenticity, there are clearly some poems that were not composed by a sixth-century ‘Antarah ibn Shaddād but belong to a much later stage in the development of his legend. So they cannot, therefore, be authentic in the sense that they did not originate in sixth-century Arabia. As I said at the end of the introduction, one of the key moments for me was when I realized that, in order to translate the later poems from the Epic of ‘Antar well, I had to treat them as authentic. The scholar in me was telling me that these were pastiches or parodies or rhetorical exercises, so my translations just weren’t working. 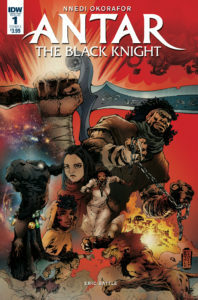 Antar the Black Knight comic. I did wonder why you included the later poems, from the Epic of ‘Antar, creations not by the poet ‘Antarah as we know him (or don’t know him), but from so many hundreds of years after the poet died. Although they’re certainly very popular, they don’t have the same inventive ka-zaam. JEM: I included them as an act of piety. That is: They were part of the selection of poems chosen for us by Peter Heath. This is very much a communal book; it’s a book that’s grown with the Library of Arabic Literature (LAL), and that grew out of the LAL community. We’d approached Peter Heath who was the world expert on The Epic of ʿAntar. I felt that, when Peter died, sadly far too young, it was important that his selections be retained as a central part of our community. Also, I liked the fact that they added to the scope of the book because they showed that these poems were, in some ways, the precursors to the ‘Antar comic [by Nnedi Okorafor]. It showed how ‘Antarah was kept alive. I think there’s a street in Jerusalem called ‘Antarah ibn Shaddād Street. He’s very much alive as the embodiment of overcoming the odds, of succeeding despite all the disadvantages that you’re confronted with. So I think, in the end, that they make for an interesting exploration of the phenomenon of ‘Antarah. To go back to the poetry by ‘Antarah, and to the relationship between poetry and Death, or poetry and violence, well: Is it necessary for a warrior to be a poet? JEM: I don’t think that all warriors were poets, although I think that probably all poets were warriors. There were no quiet, retiring poets among the men of the sixth-century Najd. JEM: Not as far as I can see. Even the poetry of Zuhayr ibn Abī Sulmā, often referred to as the “moralist,” exudes the warrior ethos. And the surviving poetry that was composed by women such as Al-Khansāʾ commemorates those dead in battle. I think that the poetic celebration of these martial exploits is an attempt to fix them in words, to anchor or root them in Time, and that this is an important part of keeping one’s ancestors alive. You the poet are, at this moment, the last of a long line of glorious ancestors, and if you do not try to immortalize their exploits by fixing them in a language rooted in Time, then you’re not being true to the lineage, and there’s a chance that the ancestors will then disappear. Thus poetry is another way of doing battle? JEM: It is. I think the ancestors are, in a sense, ever-present in this poetry and what’s really interesting about ‘Antarah, of course, is that he doesn’t automatically have access to this glorious lineage because of his birth—at least in the standard version of the ‘Antarah story, which I don’t see much reason to doubt. It seems as plausible as any other. 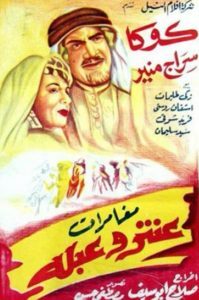 Film poster for The Adventures of ‘Antar and ‘Ablah, 1948. Via IMDb. As you wrote in your introduction, the commentaries all seem to agree that ‘Antarah was the son of a notable father and a mother who was a Black slave. The version of the poem that’s quoted in Iṣbahānī—I don’t know whether all of it is genuine or not. But it conceivably reflects attitudes consistent with Iṣbahānī’s society, but different from attitudes consistent with Ibn Qutaybah’s. So the different versions say more about the anthologizers than they do about ‘Antarah. Ibn Qutaybah was himself an outsider from Persia writing for a cosmopolitan elite. This elite was fascinated and scrupulous about lineage. And in many ways ‘Antarah becomes a puzzle: How can someone be so valorous, and so chivalrous, and have his exploits ring so loud, when he doesn’t have the breeding that society thinks you need in order to achieve those things? Back again to the poet as warrior. One of your footnotes refers to how these poems were later used, in Umayyad times, to incite warriors before battle. To what extent is that the poetry’s voice? JEM: That is certainly the voice of many of the poems translated in the book. But I was conscious that there was always a danger, when translating these poems, of lapsing into a kind of facile stridency. ‘Antarah’s Arabic is often highly developed, highly stylized. 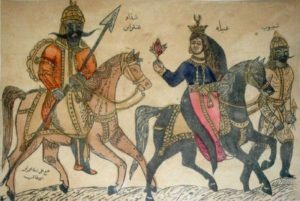 It is no less sophisticated than some of the other great pre-Islamic poets renowned for their verbal accomplishments, say Imruʾ al-Qays or Al-A’sha. And I felt I had to be true to the language I was listening to. I knew we were effectively dealing with a legend, so if I had said to myself—this is all about one man’s attempt to gain recognition in a society, I would have started listening to that narrative instead of listening to the poetry. It wasn’t until a later stage, when I was collaborating with Richard, that it became desirable to create the voice consistently across the collection. It’s not that the voice is an imposition on the material, it is certainly ever-present, but it wasn’t my starting point as a translator. Did you discover the voice or create the voice? JEM: A bit of both. Once it worked in one place, then life as a translator become a bit easier, as it could be replicated in another. But I was very keen throughout to avoid latching onto monotone, a single voice in one register. I tried very hard not to lapse in to a facile stridency. Click here to read the second part of this interview.